Breads and Desserts, Cakes & Pies, Cuppylicious! 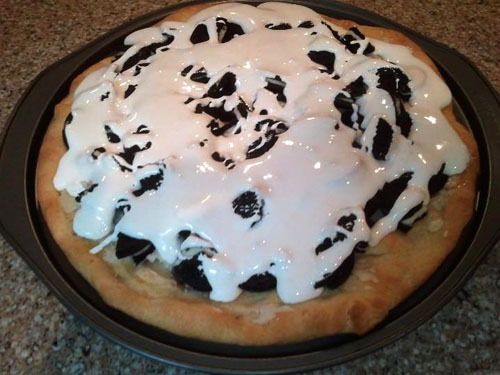 There’s a pizza company who used to make this dessert pizza. I’ve deconstructed it to marshmallow creme, frosting and oreo cookies. Preheat oven to 400F or according to directions, if using a premade pizza dough. Spread out pizza dough, starting at center, on a standard round pizza pan. Prebake crust for 8-10 minutes, until it’s just starting to brown. Remove from oven. Spread frosting over pizza; it will be melty, but that’s ok! Sprinkle broken cookies over frosting. Bake 6-10 min or until golden brown around edge. Melt marshmallow in microwave on HIGH 25 seconds, stir well. Drizzle (or slosh, as pictured above) over pizza. * Click here to see the recipe I use for pizza dough. Pictured is a Pillsbury Artisan Pizza Crust that we spread out to fit a round pan.